Octopuses, squid, and cuttlefish often do not follow the genetic instructions in their DNA to the letter. Instead, they use enzymes to pluck out specific adenosine RNA bases (some of As, out of the As, Ts, Gs, and Us of RNA) that codes for proteins and replace them with a different base, called Inosine. This process—called "RNA editing"—is rarely used to recode proteins in most animals, but octopuses and their kin edit RNA base pairs in over half of their transcribed genes. 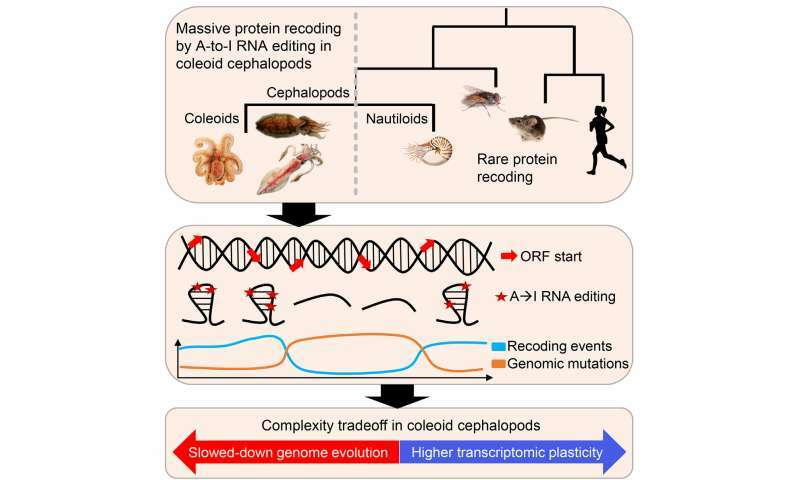 When researchers did experiments to quantify and characterize the extent of this RNA editing across cephalopod species, they found evidence that this genetic strategy has profoundly constrained evolution of the cephalopod genome. The study appears in Cell on April 6. In fact, RNA editing is so rare that it's not considered part of genetics' "Central Dogma." "Ever since Watson and Crick figured out that genetic information is stored in DNA, we've had this view that all the information is stored in DNA, and it's faithfully copied to another molecule when it's used—that's RNA, and from there, it's translated into the proteins that do all the work. "And it's generally assumed that that's a pretty faithful process," explains study co-author Joshua Rosenthal, a cephalopod neurobiologist at the Marine Biological Laboratory in Woods Hole, MA. "What the squid RNA is showing is that that's not always the case—that, in fact, organisms have developed a potent means to manipulate information in RNA." Most organisms extensively use splicing, the process of cutting or adding whole sections of RNA transcripts before they leave the nucleus, to diversify their proteomes, but prioritize DNA flexibility over RNA editing. "We usually think of evolution using whatever it can to answer some challenges—so why was RNA recoding not used?" says Eisenberg. "Now, we have an example of what happens when we do use RNA editing abundantly. We know there's a price. 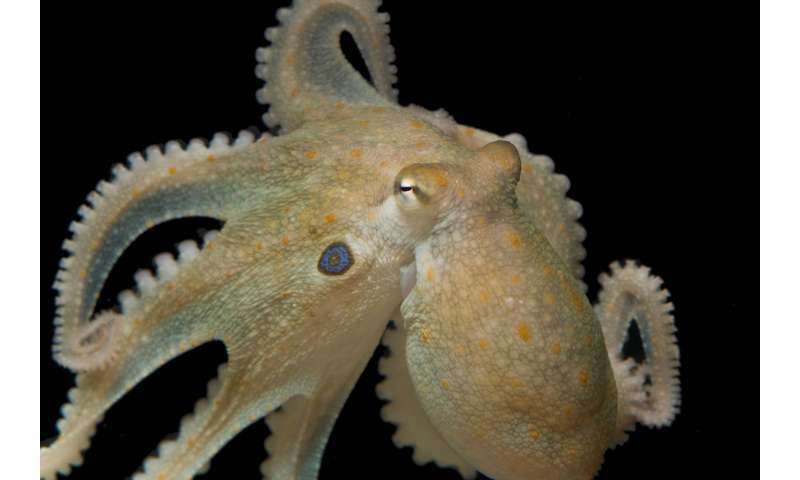 The price is slowing down genome evolution...Cephalopods probably chose to take this RNA bargain over genome evolution, and maybe vertebrates made the other choice—they preferred genome evolution over editing." Did Octopuses become "brains" in a hospitable environment which gave them more flexibility to form themselves whereas land creatures had to "build" complex systems to support their "brains" in a hostile environment ( air)? The basic environment of the ocean and it's predators is only going to change relatively slowly compared to the seasonal variations and annual changes on land. Perhaps it makes more sense to be able to create specific proteins only at need rather than getting all of them in case ye might run into the need, as happens on land more often than not.